Spice blends are the lazy (or just busy and harried) cook’s answer to bland veggies. Who doesn’t have time to sprinkle a little spice over some cookedvegetables? No one. So there’s no excuse for having an unappetizing blob of vegetables taking up the real estate on your dinner plate. For best flavor, get the freshest herb and spice blends, like these purchased from a spice shop. And be sure to store them in airtight containers, like these from Tupperware. I’ve always created custom spice combinations for my vegetable sides, and even wrote a series on how to become an herb and spice adventurer. Recently I discovered an equally fun (and much less intimidating) approach in premixed spice blends. The expert balance of flavors in Herbes de Provence is a sure bet for a wide array of dishes. As a timeless classic, it can be found anywhere herbs and spices are sold, from the bulk section of Vitamin Cottage to the herbs and spice section of a regular grocery store. If buying in bulk, half an ounce will easily last a month or two. 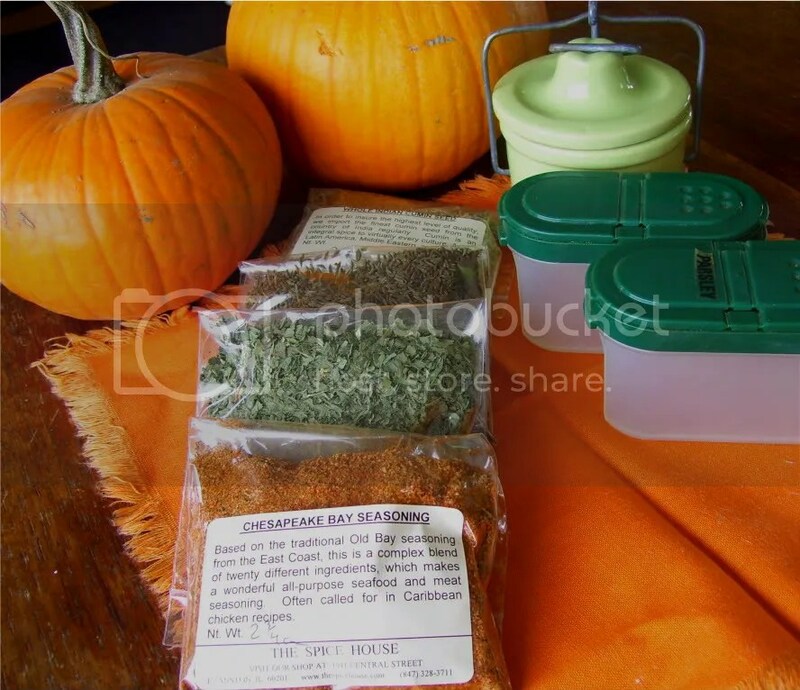 The Tarragon Shallot Citrus Seasoning is a custom Savory Spice Shop blend, but equally versatile and fun. If you can’t get to a Savory location, order it on line. Bulk Buying Best: I was always reluctant to try spice blends because the ones in a typical grocery store are fairly expensive, doubly so if I didn’t like one and had to pitch it. This problem is alleviated now that blends can be bought at spice stores (online or storefront), or from the bulk section of a health foods store. You can do a taste test at the store to pre-qualify a blend. Then you can buy just a small amount to cook with and make sure it appeals to your taste buds. Buying in smaller amounts also means a blend will likely be used up before going bad and having to be tossed. Watch Out: If you do choose a pre-bottled, commercial blend, read the ingredient label! They often contain artificial flavorings, colorings and preservatives, needless additions since good spices have plenty of flavor on their own. One more reason to buy at a local spice store, where blends are made only with herbs and spices, what a surprise! Crush and Sprinkle: Remember to gently rub Herbes de Provence (or any leafy dried herb) between your hands while sprinkling into a dish. This helps release its flavors more fully. Did I Mention Fun? For cooks caught in a rut, the biggest problem often isn’t a lack of recipes, time or energy. It’s an “inspiration-deficit.” Just walking into a spice store will remedy that problem. Wander around the flavors and blends and you’ll soon be itching to try something new. Ready for an Adventure: Savory Spice has several locations in the Denver Metro Area, California and North Carolina. Penzey’s Spices also has locations all over the country. Both of these stores sell on line as does The Spice House. For a lot of interesting info on spices and delectable recipes, see Jane Spice. Want to learn more abut herbs, spices and blends? This is exactly what we do in Whole Kitchen Cooking Classes. This week, seasonal cauliflower and carrots will be transformed from ordinary to sublime when jazzed up with two more of Dan’s suggestions: Vietnamese Sweet Lemon Curry and Vadouvan, a French curry blend. Check out the current class flyer.